Coming soon to fancyflours.com: CAKE STAND WRAPPERS! Be the first to know about these exquisite cake stand wrappers! Not only does fancyflours.com currently carry a wide assortment of cupcake wrappers (shown above in white filigree), but coming soon to our online store are Cake Stand Wrappers! Available in approximately two weeks, these gorgeous wrappers will make any old cake stand, a unique beauty! Cake stand wrappers will be available in the design shown above as well as other fun & festive styles. Check our online store @ fancyflours.com for availability. This entry was posted in Baking Inspiration by Fancy Flours. Bookmark the permalink. Need to get some fancy cupcake paper liners. Saw a booklet that said you have them; but I cannot seem to get to them-not wrappers but liners. My name is Shannon and I’m the editorial assistant at Foodbuzz.com. Following up on a recent email invitation to be a part of our newly launched Foodbuzz Featured Publisher program, I just want to reiterate that I am very impressed with the quality of your posts. I would love to send you more details about the program, so if you are interested, please email me at Shannon@foodbuzz.com. I am so delighted to see the cupcake wrappers, which I purchased, and the cake stand wrappers which should be available soon. Can I possibly be notified via email when they are available? 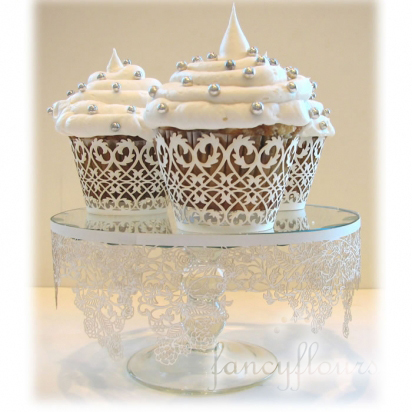 How do we buy the filigree white cupcake liners listed in Country Living magazine? Give me an address or phone number. Any stores in Phoenix? I like what I am seeing on your website! You carry some unique products to enhance baked goods. I particularly like the fancy cupcake liners and matching cake stand decorations. Great job at putting together a site where bakers can rely on finding exactly what they are looking for. I look forward to becoming one of your latest customers. Thanks! Bulk Pricing is available on select cupcake wrappers. Please email us at info@fancyflours.com for more information.